The owner-operator of the Jonathan Byrd's Fieldhouse on the Grand Park campus in Westfield is partnering on another indoor youth sports facility in Hamilton County. 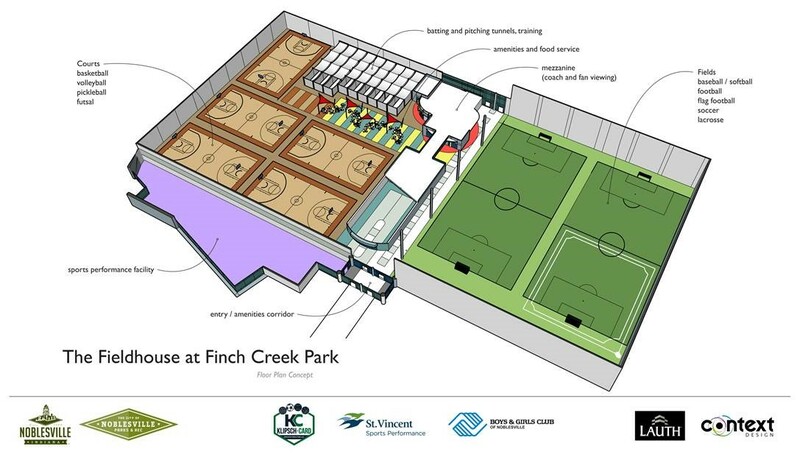 Plans from Klipsch-Card Athletic Facilities LLC for the $15 million Noblesville Fieldhouse at Finch Creek Park call for five hardwood courts, turf fields and physical therapy space. The company is led by co-presidents Mike Klipsch and Andy Card and will own and operate the facility and also handle marketing and rental scheduling. Card boasted "without a doubt, the Noblesville Fieldhouse will be the most advanced, state-of-the-art, indoor sports facility in the country. And we can't wait to show off this community to the likes of Nike, Adidas and other major brand names in the sports industry." Work is expected to begin in late spring on a 10-acre parcel in the city park, will be acquired by the company for $1 million. The 130,000 square-foot project still needs approval from the city council. Mayor John Ditslear says the facility will help drive more tourism dollars to Hamilton County. "We love our youth sports in Noblesville, but we've heard time and again how they need more room, more courts, more fields and more practice time. And we've listened,” said Ditslear. "I look forward to the ripple effect that will benefit our local businesses and community partners." The city says its portion of funding toward the facility will not come from the general fund, but rather it will use $600,000 per year from property taxes and rental fee revenue and chip in additional funding totaling up to $200,000 annually. Ditslear says the project "nearly pays for itself." Developers expect the facility to create 40 full-time jobs and 350 part-timers to staff operations, coaching, training and event roles. "Together, we can attract tournaments that might otherwise go to Chicago, and instead, keep those tourism dollars here in Hamilton County," said Ditslear. The proposal is slated to go before the council December 6. You can read more about the plans by clicking here.